EVANSTON, IL. Chicago, IL. The Force didn’t let three weeks off change the direction or mind set of a return trip to the National Championship game, as they dismantled the previously undefeated Atlanta Phoenix 84-0 on a beautiful sunlit Saturday afternoon. Head Coach John Konecki apologizes to no one for the lopsided score. “My job is to have my team prepared to go out and put points up on the scoreboard. I can’t worry how the other team reacts,” he said. When 14 touchdowns are scored, there are a lot of great plays along the way both offensively and defensively. The winning score came on Chicago’s first offensive possession. A couple of nice catches and runs by Brandy Hatcher, who added a touchdown and two two-point conversions, a 31 yard catch and run by Jeanette Gray to the Phoenix 16 yard line, set up a nice over the shoulder pass from QB Sami Grisafe to Ashley Berggren for her first of two touchdowns on the day. Mary Choules pushed through for the two point conversion, converting six of those throughout the contest. The savvy offensive line led by Jamie Menzyk, Rosalyn Bennett, Dawn Pederson, Becky Thuestad, and Tami Engelman are sometimes taken for granted, yet provided ample protection for Grisafe. Wrap your head around the fact that Grisafe threw ten touchdown passes completing 31 of 38 for 546 yards. “With that kind of time and protection it can’t be anything but fun,” said Grisafe. Offensive game day MVP Gray had an incredible 7 touchdowns for 334 yards, many times taking a screen pass at the line of scrimmage and turning a nifty run into a score. “I’ve said this before; my off-season training program is really paying dividends now. I’m happy with my progress,” said Gray. Rookie wide receive Karlee Quaritsch continues to gain confidence both personally and from fellow players and coaching staff with her tight route running and good hands. She added a nice catch and run to extend the score. There were enough defensive highlights in this game for an entire season. Tricia Charbonneau kept Atlanta on their heels all day with kickoffs that were deep enough to pin them back in their own territory. Special team’s player Taylor Malloy seemed to be in on every tackle. “Malloy is a special teams demon and I love to watch her attack,” praised Konecki. The Force will host the Boston Militia in a rematch of last year’s Conference title game Saturday July 20. The winner moves on to the National Championship to be played in San Diego California August 3. 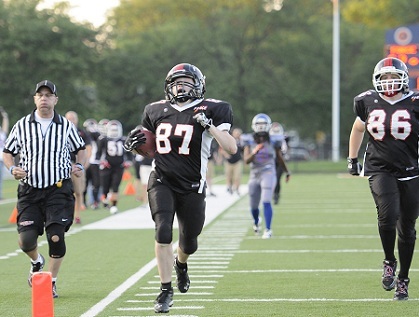 For tickets and more information please visit chicagoforcefootball.com or call the Force hotline at (872) 222-5078.